The U.S. Supreme Court’s historic Tinker ruling is still cited in nearly every student First Amendment case, and almost all American civics and history textbooks refer to it. 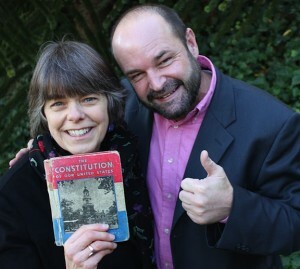 Mary Beth Tinker and Student Press Law Center attorney Mike Hiestand, who has helped 15,000 students, teachers and administrators navigate student speech issues over the past two decades, are on the Tinker Tour across the country to promote youth voices, free speech and a free press. The year was 1965, when about 1000 soldiers had been killed in Vietnam. Inspired by an antiwar rally in Washington, D.C., Mary Beth Tinker and a handful of high school students wore armbands to mourn the dead and to support Robert F. Kennedy’s call for a Christmas truce. They were told to remove armbands by the vice principal. They did but faced suspension anyway. Four years later, following heated school board meetings, death threats to their families, legal help from the ACLU and two lower federal court cases, the U.S. Supreme Court heard the case. Feb. 24, 1969, these students won a landmark ruling in favor of First Amendment rights for all students. The Tinker Tour brings real-life civics lessons to schools and communities through Mary Beth’s story and those of other young people. Over 40 years ago she made a difference with just a simple, black armband. Students from Illinois and Wisconsin high schools shared real-life stories about how students are keeping the First Amendment alive at the KEMPA Fall Scholastic Journalism Conference. The Tinker Tour has also been endorsed by many of the country’s leading civics education, civil rights and journalism education and journalism groups. Check out more about Tinker v. Des Moines Indep. School Dist. at tinkertourusa.org. Mary Beth Tinker recounts her journey and the panel discusses the impact of the landmark Supreme Court ruling, Tinker v. Des Moines Independent School District. She and other high school students made history by wearing black armbands in protest of the Vietnam war. Their suspension ultimately led to a Supreme Court decision cited by judges in almost 6,000 cases to protect student rights. The expert panel discusses the 1969 Supreme Court Tinker decision and what the courts have done since as it affects student expression today. With Tinker considered a high-water mark for student free speech rights in America, the session addresses The Supreme Court’s 1988 Hazelwood and other court decisions involving student media as well as off-campus and Internet-based student expression. High school students and the panel discuss the the First Amendment and student expression today. What issues involving student media as well as Internet-based student expression are important to high school students? Do you feel free to talk about and address these issues?